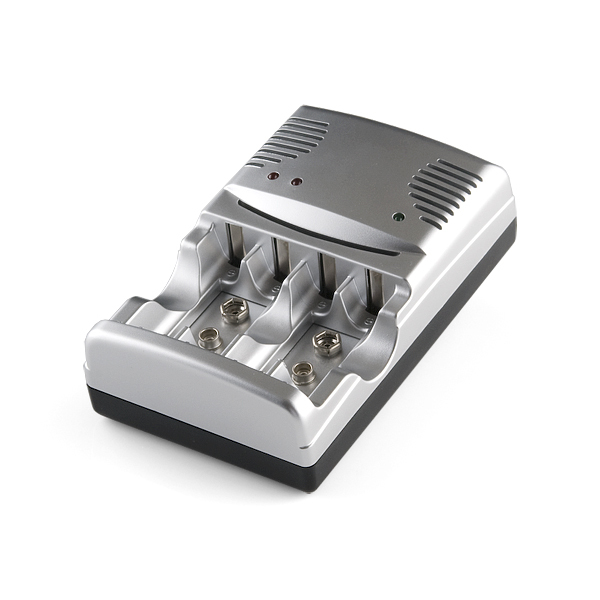 Need a simple and versatile battery charger? This one can charge 4 AA or AAA batteries at a time. Or, you can use it to charge 2 9V cells as well. 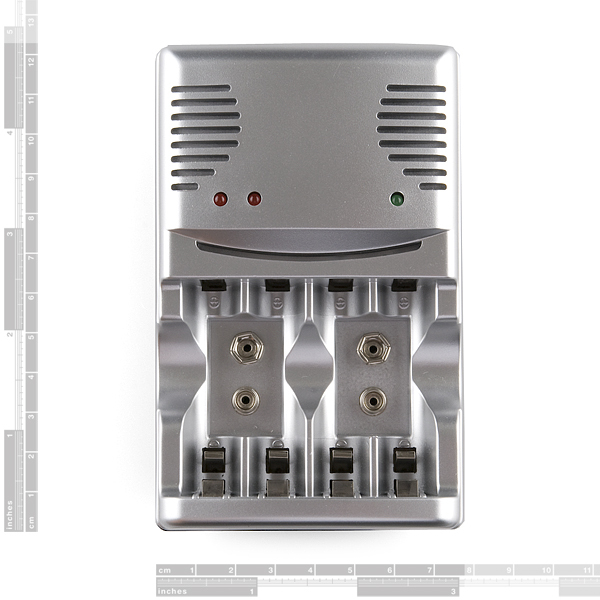 It plugs directly into the wall and has status lights indicating charge status. Note: This will only work with NiMH batteries! What do the lights indicate on the charger. Yeah a description about that would be nice. How does this compare with the charger that comes with the eneloop or pro eneloops? Recent online surveys seem to put those as the best NiMH batteries available. I know that charger can do a single battery at a time, but I'm sure I'll usually use pairs anyway. 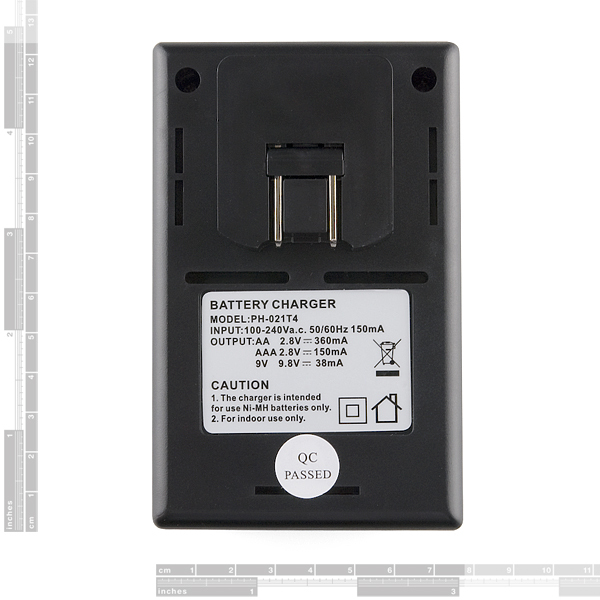 For me, having 1 charger that can charge 8 batteries at a time (even if I have to give up the 9V charging capability, the 9V sold here are Li-ion anyway) would be better than buying 2 chargers that can charge 2, 3, or 4 per charger (or 6 if you at extenders to the 9V ports but that seems like a really bad idea) 8 AA/AAA charger unit please! Is it normal for this to have a high pitch noise emanating? Did you experience any other issue with your charger? Mine also have a high pitch sound when charging AA batteries. high pitch noises when charging batteries are common. If you listen close enough, I'm sure you'll hear a variety of noises coming from other electronics you use! I know this is stupid to ask, what is the difference in NiCd and NiMH ? 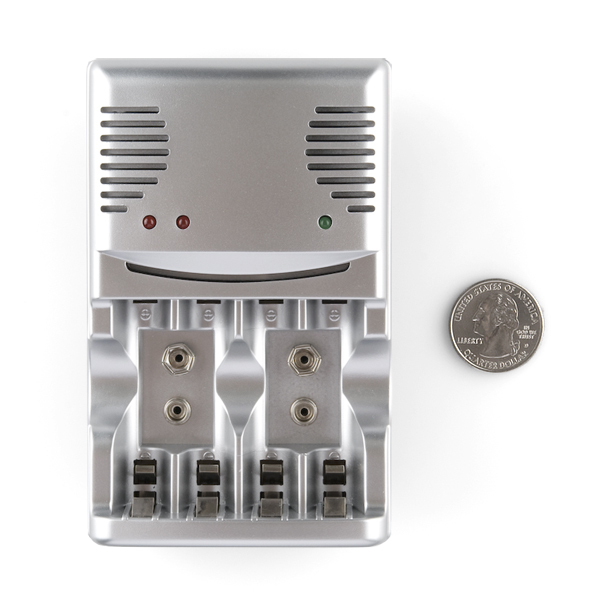 I just got 2 of these for my robotics projects, they seem to have a separate charge circuit for each pair of batteries allowing you to charge 2 or 4 at a time, hence the 2 LEDs for charge status. It won't even light up the charge LED with only one battery. This is just fine if you're like me, and need even numbers of batteries. Light on specs - does it have independent charging channels for each cell? Independent channels per cell is a very important feature to keep sets of cells balanced, and is available in chargers that cost only $25-30. Yeah, I know. We are trying to get specs. Apparently not. :-/ Let me try again.